We also found a match between supra-long Scandinavian pine masters and the Roman time complex of some European oak chronologies in our recent investigation. This match appears 218 years offset from the conventional dating of the Roman complex. Referee 6. has rejected this match as being not stable over time and blockwise not significant. What do we know about sample and reference? What does the proposed match look like? What is a significant match? Definition of minimum criteria. Does the sample fulfill the minimum criteria? 1a. What do we know about RomanAll? RomanAll is compiled from four validated Roman time masters. TegelRoman is 728 years long (-512 to 217) and has been synchronized by us from raw measurement series. It contains French archaeological data. Our interpretation complies with the interpretation of the author. HollsteinRoman is 861 years long (-545 to 315) and has been synchronized by us from sitewise mean value curves published handdrawn in an old book. We have carefully studied the relevance of these curves and found a corr.coeff. of at least 0.98 towards "original" meanvalue curves which we could get hold of. HollsteinRoman matches convincingly towards TegelRoman and the old Becker-master. It contains some highly significant archaeological site collections from the Rhine valley and northern Switzerland. Our interpretation complies with the interpretation of the author. GB2 (727 years, -946 to -220) and SwanCarr (844 years, -1154 to -311) are synchronized by us from undated QUB raw measurement series from bog oaks. Floating in time, but datable against published series on ITRDB. Our conventional dating complies with QUB publications. QUB's interpretation of the raw data is not yet published. As our dating of all four chronologies complies with the literatur, we found it legitimate to combine them in the form of mean value curves as a Roman time master. The archaeological chronologies overlap the bog oak chronologies with about 300 years. The direct match between these blocks is not good but clearly visible, and has been confirmed via English chronologies. 1b. What do we know about FinlandPine? 7638 years long and continuous, absolutely dated -5633 to 2004. Validated by us. Result question 1.: We have two internally sound chronologies with known start and end dates (at least conventional), and we know the overlap of these curves, 1470 years. 2. What does the proposed match look like? Let's check if there is a match between the chronologies. We set the "least overlap in years between samples when correlating" to 1400, select Hollstein normalization and sort by t-values. FinlandPine as reference. The best match is at 533, corr. coeff. 0.16, t=6.1, well discriminated against the next best match at 1512, corr. coeff. 0.10, t=4.0. Note: The match at 533 is also best with Torneträsk pine as the reference, but has "only" corr.coeff. 0.11, t=4.3. In CDendro, you can make the block analysis for the selected (in this case the best) match directly in the crossdating curve display. Figure 1: RomanAll oak against FinlandPine as ref., Hollstein normalization. The red figures under the trend bar on the curve diagram are the corr.coeffs. of the blocks. Note the block parameters in the lower left corner of the diagram (red oval). Click on the diagram to see details, go backwards one page to close the diagram. There is quite good correlation (for an interspecies match over long distance) at the start and the end of the match. Inbetween the match is weaker, but still apparent. In the "Piled correlation diagram" below, we show all the (positive) correlation values (correlation coefficients (red piles) and t-values (blue piles)) for each of the 6307 possible synchronization points between the sample curve and the reference curve. The conventionally assumed synchronization point at 315 (at index 1689) is not prominent in this case (t=0.3). Instead a match 218 years later (at 533) has the highest "pile" and is well discriminated from the next highest pile (1512). Figure 2: RomanAll oak against FinlandPine as ref., Hollstein normalization, piled correlation diagram. Note the CDendro settings and the toggle-button (Show/Close) for generation of this diagram in the red oval. Note the high pile at 533 (218 years later than expected) with t > 6 while all the other tested overlapping positions yield a t-value well below a "noise threshold" of t=4.5. Result question 2.: RomanAll definitely has a significant synchronous position but 218 years later as conventionally assumed. The match is not time-stable over its whole length. 3. What is a significant match? Definition of minimum criteria. Our reasoning when defining minimum criteria for a significant match is described in detail here. To be on the safe side, we require at least a t-value = 6 (two units above "noise level") for a significant (i.e. unique) match. The overlap of our sample is 1470 years. This results in a minimum correlation coefficient of 0.15, if the match would be time stable over its whole length. Result question 3.: To reach a significant match of RomanAll oak against FinlandPine, we require a t-value = 6 which means an average minimum correlation coefficient of 0.15 at an overlap of 1470 years. 4. Does the sample fulfill the minimum criteria? With these parameters, the match of RomanAll against FinlandPine is fully significant over the latest 600 years, and than again for the oldest 500 years. This conclusion can be derived from the block analysis shown in Figure 1. To see what happens inbetween we have look at the chronologies which RomanAll is assembled of. The younger part (more than 800 years) consists of archaeological collections from the Rhine valley. In the oldest part of HollsteinRoman are site collections from northern Switzerland, which most probably will lower the correlation towards northern Scandinavian pine. Figure 3: HollsteinRoman oak against FinlandPine as ref., Hollstein normalization, best match at 533 (corr. coeff. 0.15, t=4.3 at 861 years overlap). This match has nearly moderate significance, but is weak in its older end. Figure 4: Mean value of HollsteinRoman and TegelRoman oak against FinlandPine as ref., Hollstein normalization, best match at 533 (corr. coeff. 0.16, t=4.7 at 861 years overlap). This match has moderate significance. Adding the French master "Classic oaks" to the mean value curve helps to pass the block analysis successfully, but the overlap is still too short to reach full significance (t=6). Figure 5: Mean value of HollsteinRoman, TegelRoman and Classic oak against FinlandPine as ref., Hollstein normalization, best match at 533 (corr. coeff. 0.17, t=5.1 at 861 years overlap). This match has still moderate significance. Figure 6: Mean value of HollsteinRoman, TegelRoman and Classic oak against FinlandPine as ref., Hollstein normalization, piled correlation diagram. We could stop here as we already have demonstrated the significance of this highly controversial match, but our goal is full significance (t=6). This we reach by increasing the overlap with the material we have at our disposal: bog oak collections from Irland and England. The result is shown in Figures 1 and 2. Lastly, let's have a look at the conventionally assumed synchronous position 315. Figure 7: RomanAll oak against FinlandPine as ref., Hollstein normalization, at the conventionally proposed position of match (315). Corr.coeff. 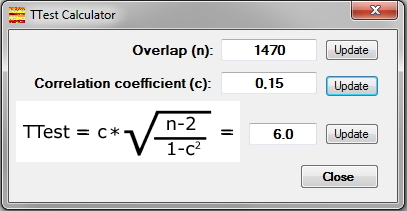 0.01, t=0.3 at overlap 1470 years. This plainly can't be right as we always see at least a weak positive correlation coefficient with European oak chronologies with known end date. No further comments. Result question 4.: The match of RomanAll against FinlandPine fulfills the minimum requirements for a significant match.